Analyzing the graph of a trigonometric function can be readily accomplished with the aid of a graphing calculator. Such an analysis can determine the amplitude, maximum, minimum, period, or phase shift of a trig function, or solve a trig equation or inequality. The examples and exercises in this and the next two sections show how a variety of trig problems can be solved without using a graphing calculator. They also explain how to solve trig equations and inequalities and how to analyze inverse trig functions. Since the values of all the trigonometric functions repeat themselves at regular intervals, and, for some number p, f(x) = f(x + p) for all numbers x, these functions are called periodic functions. The smallest positive value of p for which this property holds is called the period of the function. The sine, cosine, secant, and cosecant have periods of 2 , and the tangent and cotangent have periods of . 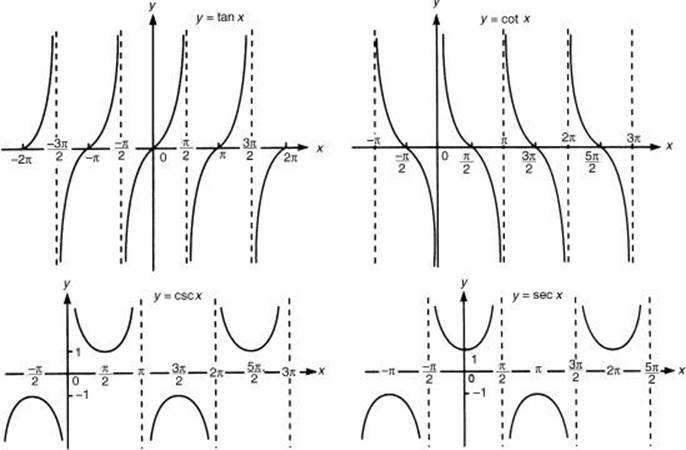 The graphs of the six trigonometric functions, shown below, demonstrate that the tangent and cotangent repeat on intervals of length and that the others repeat on intervals of length 2 . 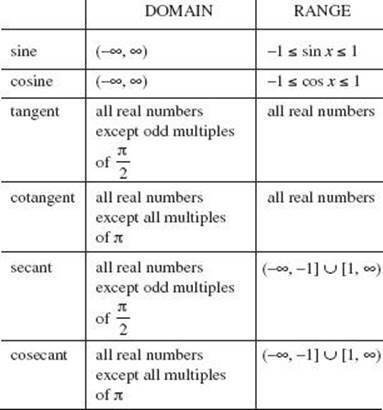 The domain and range of each of the six trigonometric functions are summarized in the table. Trig functions can be transformed just like any other function. They can be translated (slid) horizontally or vertically or dilated (stretched or shrunk) horizontally or vertically. The general form of a trigonometric function is y = A · trig(Bx + C) + D, where trig stands for sin, cos, tan, csc, sec, or cot. The parameters A and D accomplish vertical translation and dilation, while B and C accomplish horizontal translation and dilation. When working with trig functions, the vertical dilation results in the amplitude, whose value is |A|. If B is factored out of Bx + C we get . The horizontal translation is and is called the phase shift, and the horizontal dilation of trig functions is measured as the period, which is the period of the parent trig function divided by B. Finally, D is the amount of vertical translation. The frequency of a trig function is the reciprocal of its period. Graphs of the parent trig functions follow. sin x is an odd function. Note: cos x is an even function. 1. Determine the amplitude, period, and phase shift of y = 2sin 2x and sketch at least one period of the graph. Since the phase shift is zero, the sine graph starts at its normal position, (0,0), and is drawn out to the right and to the left. 2. Determine the amplitude, period, and phase shift of and sketch at least one period of the graph. Although a graphing calculator can be used to determine the amplitude, period, and phase shift of a periodic function, it may be more efficient to derive them directly from the equation. 3. 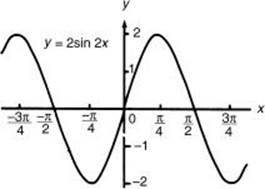 Determine the amplitude, period, and phase shift of y = –2 sin( x + 3 ) and sketch at least one period of the graph. Since the phase shift is –3, the sine graph starts at x = –3 instead of x = 0, and one period ends at –3 + 2 or x = –1. The graph can continue to the right and to the left for as many periods as desired. Since the coefficient of the sine is negative, the graph starts down as x increases from –3, instead of up as a normal sine graph does. 1. In the figure, part of the graph of y = sin 2x is shown. What are the coordinates of point P? 5. For what value of P is the period of the function Px equal to ? 6. If , what is the maximum value of the function ? 7. If the graph in the figure below has an equation of the form y = sin (Mx + N), what is the value of N?